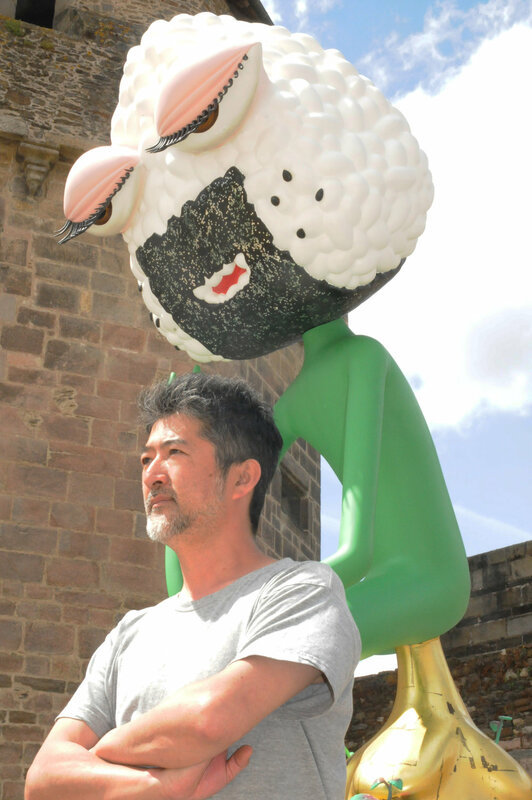 An iconic Tokyo-based artist, Makoto Aida has, for more than 20 years, offered a flawless social commentary on Japan's modern culture, highlighting the complex norms of the country and exploring topics ranging from sexuality to war. His works range from fine graphic paintings such as The Picture of an Air Raid in New York in 1996, showing Japanese WWII fighter jets attacking the Manhattan skyline, to videos such as Lonely Planet, 1998, where the artist sat in front of a world map by dialing random numbers to see what languages eople use in different countries. One of his most controversial works was the Assisted Suicide Machine series, 1986-2002, consisting of knots made from hiking and safety gear designed to collapse under the weight of the victim. A small plastic stool to help a child reach a noose has formed the most notorious object in the series. After a controversial retrospective exhibition at the Museum of Contemporary Art in Tokyo (2016), Makoto Aida has exhibited in many places in Japan and internationally. Winner of the "Visions of the City - Obayashi Foundation Research Program" first prize, he has recently invested a disused site of this construction company with a building-wide exhibition (Ground No Plan, 2018).